Sir David Omand would put a missing ingredient, the consumer, in the middle of the cycle (missing in your diagrammed version of his work). Another model, SIDeARM, add clients and management (i.e., process) in their version. 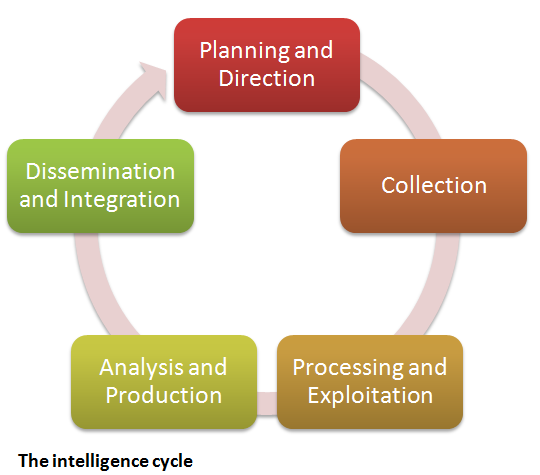 Other missing elements to almost every Intelligence cycle model I’ve seen is that they do not typically incorporate counterintelligence or covert operations. The USG did directly address these in this version of the techniques document — http://www.amazon.com/Tradecraft-Primer-Structured-Techniques-Intelligence/dp/1478361182/ — but haven’t seen them addressed much elsewhere. When I was taught about the intelligence cycle – I remember being taught, that the 4th step (Production) almost falls into the realm of the 3rd step (Analysis). This is because production doesn’t really occur in a vacuum, and the production of the intelligence is being created, and refined throughout the whole process. Thats’s why I was taught the four step Intelligence Cycle – Direction, Collection, Analysis and Dissemination. Whilst I understand there’s other aspects (such as storage and feedback), these are the CORE Phases of the intelligence Cycle in my opinion. Always up for a good intelligence related discussion.